Sea Holly or Holly-leaved Mangrove grows in the undergrowth of mangroves, swamps, along river banks and marshes of Southeast Asia. Besides, it contains medicinal properties. 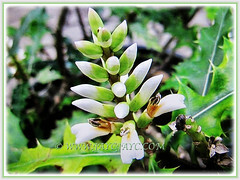 Acanthus ebracteatus is listed as vulnerable in the Red List of threatened plants of Singapore. 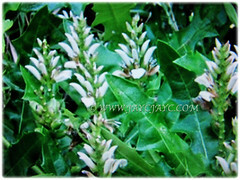 Botanical Name: Acanthus ebracteatus (syn. : Acanthus xiamenensis). 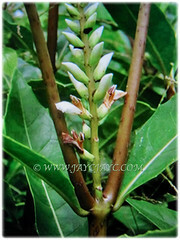 Common Names: Sea Holly, Holly Mangrove, Holly-leaved Mangrove, Jejeru Hitam in Malay. 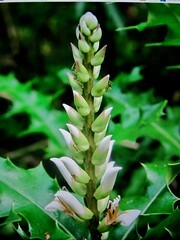 Etymology: The genus name, Acanthus is from the Greek word akanthos, derived from akantha, meaning thorn or prickle. The specific epithet is from the Latin word ebracteatus meaning without bracts. Origin: Native to Tropical Asia, Western Australia and Polynesia.It widely cultivated elsewhere around the world. Plant type:An ornamental and perennial vine. 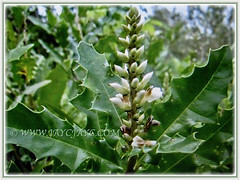 Features: Acanthus ebracteatus is from the genus Acanthus that consists of about 30 species of flowering plants. It grows as an erect, spreading or scrambling shrubby herbaceous plant that grows up to 2 m tall. Usually, its green stems are hollow with numerous spines. Its sprawling growth allows it to spread by vegetative growth. Nevertheless, it usually remains short and shrubby, up to 1-1.5 m tall. It has a tap root system that stays close to the soil surface. 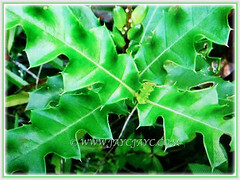 Its holly-like leaves are dark green, stiff, glossy and deeply lobed with sharp spines at each lobe’s tip and curved in full sun, flatter in shade. Plants growing in deep shade can produce leave that can be totally spineless. The 3-6 mm petiolate leaves have leaf blades that are oblong to oval, with toothed leaves that are deeply lobed with spine tips along the leaf margin. They are 7.5-20 by 2.5-6.5 cm, often widest below middle.Leaves are oppositely arranged along the stems. Its bisexual flowers have white petals that turn brown with age. The many-flowered and upright spike up to 11 cm long are terminally located at branch tips. Its flower up to 2.5 cm long with ovate bracts up to 7 mm long. Calyx lobes ovate, as long as bracts and corolla usually white. Its flowers are probably bird and insect pollinated. Eventually, the flowers will be followed by fruits that are small nut-like capsules. Each fruit is a square-shaped capsule which explodes when ripe, projecting the off-white seeds up to two metres from the parent plant. 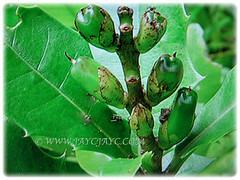 Its fruits are oblong and slightly flattened, green to dark green and less than 2 cm long. The fruits contains four large and flat seeds. It looks superficially similar to Acanthus ilicifolius. Culture (Care): Acanthus ebracteatus or Sea Holly can be easily grown with least maintenance. Light: Best in full sun where they grow lush and bushy. It can tolerate semi-shady location but tend to become leggy in shape. Soil: Any standard potting soil readily available at the garden nursery. Others:Growing in nutrient-rich environment, Sea Hollies can be fed with any store-bought liquid or dry fertilisers which should be applied when needed. Be careful not to over apply as it may cause root burn and kill the plant. Always follow the recommended application dosage/dilution as stated on the packaging. Take reasonable precautions like wearing gloves while pruning as its stems and leaves have many sharp spines. 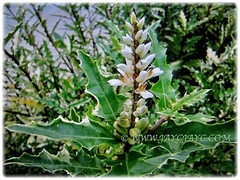 Acanthus ebracteatus or Sea Holly is a tropical and sub-tropical shrubby and herbaceous plant. It grows well in hot and humid environment. For non-hardy regions, grow it in a container to easily overwinter indoors. Alternatively, plant it in a greenhouse or conservatory with optimum light so that it will grow lush and bushy. Propagation: Easily propagated via seeds and stem cuttings. Nevertheless, stem cuttings are usually preferred as the cuttings can be obtained easily from prunings. Usage: Grow Acanthus ebracteatus or Sea Holly for its ornamental flowers and foliage. It is tolerant of saline soils and salt sprays as well. It can be grown submerged in freshwater. An ideal landscape plant for the coastal area, beachfront, pond, marsh and bog. It provides shelter for small vertebrates. Besides it has medicinal properties. Chemicals in the bark have antiseptic properties. A decoction of the plant is drunk to treat kidney stones. 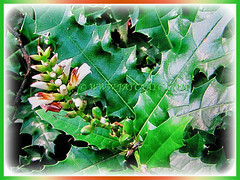 The juice from the leaves is used as a hair preserver and to relieve rheumatism. The stem and roots are used for skin diseases and longevity. Its boiled seeds are used to poultice boils and are also an ingredient for cough medicine along with Averrhoa flowers, black sugar-cane, cinnamon, and crystalline sugar. A decoction of the seeds is drunk to treat against boils. Pounded seeds are used to cure boils and the juice of leaves is reputed to prevent hair loss. The leaves of Acanthus ebracteatus, noted for their antioxidant properties, are used for making Thai herbal tea in Thailand and Indonesia.